Negative Interest Rates: Impossible, Unnatural or Just Unusual? In the years since the 2008 crisis, there is no question in finance that has caused more angst among investors, analysts and even onlookers than what to do about "abnormally low" interest rates. In 2009 and 2010, the response was that rates would revert back quickly to normal levels, once the crisis had passed. In 2011 and 2012, the conviction was that it was central banking policy that was keeping rates low, and that once banks stopped or slowed down quantitative easing, rates would rise quickly. In 2013 and 2014, it was easy to blame one crisis or the other (Greece, Ukraine) for depressed rates. 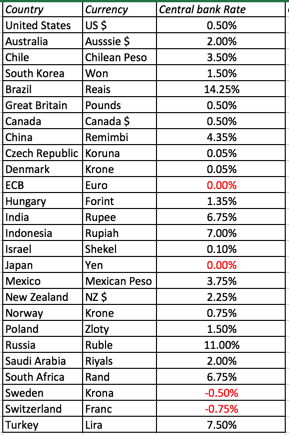 In 2015, there was talk of commodity price driven deflation and China being responsible for rates being low. With each passing year, though, the conviction that rates will rise back to what people perceive as normal recedes and the floor below which analysts thought rates would never go has become lower. Last year, we saw short term interest rates in at least two currencies (Danish Krone, Swiss Franc) become negative and this year, the Japanese Yen joined the group, with rumors that the Euro may be the next currency to breach zero. While it has been difficult to explain the low interest rates of the last few years, it becomes doubly so, when they turn negative. I would be lying if I said that negative interest rates don't make me uncomfortable, but I have had to learn to not only make sense of them but also to live with them, in valuation and corporate finance. This post is a step in that direction. 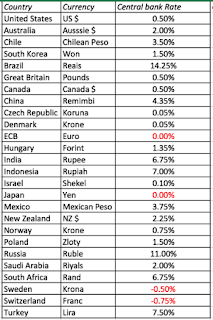 Joining the Japanese Yen is the Swiss Franc in the negative long term interest rate column. 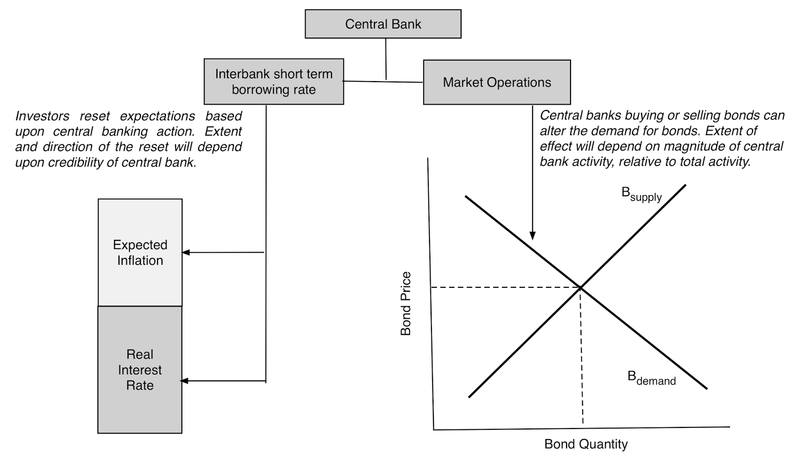 Why make this distinction between central bank set rates, short term market interest rates and long term interest rates? 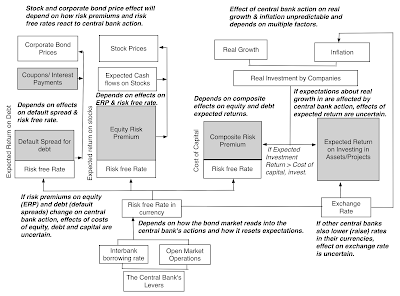 It is easier to explain away negative central bank set rates than it is to explain negative short term interest rates and far simpler to provide a rationale for negative rates in the short term than negative rates in the long term. Thus, there have been episodes, usually during crises, where short term interest rates have turned negative, but this is the first instance that I can remember where we have faced negative long term rates on two currencies, the Swiss Franc and the Japanese yen, with the very real possibility that they will be joined by the Euro, the Danish Krone, the Swedish Krona and even the Czech Koruna in the near future. I am not a macroeconomist, have very little training in monetary economics and I don't spent much time examining central banking policies. Keep that in mind as you read my perspective on interest rates, and if you are an expert and find my views to be juvenile, I am sorry. That said, I have to process negative interest rates, using my limited knowledge of what determines interest rates. When I lend money to another individual (or buy bonds issued by an entity), there are three components that go into the interest rate that I should demand on that bond. The first is my preference for current consumption over future consumption, with rates rising as I value current consumption more. The second is expected inflation in the currency that I am lending out, with higher inflation resulting in higher rates. The third is an added premium for any uncertainty that I feel about not getting paid, coming from the default risk that I see in the borrower. When the borrower is a default-free entity, there are only two components that go into a nominal interest rate: a real interest rate capturing the current versus future consumption trade off and an expected inflation rate. How do you reconcile these two worlds? To the extent that those demanding bonds are motivated by the need to earn interest that covers the expected inflation and generate a real interest rate, you could argue that in the long term, the intrinsic rate should converge on the market set rate. In the short term, though, as with any financial asset, there is a real chance that the market-set rate can be lower or higher than the intrinsic rate. What can cause this divergence? It could be investor irrationality, where bond buyers overlook their need to cover inflation and earn a real rate of return. It could be a temporary shock to the supply or demand side of bonds that can cause the market-set rate to deviate; this is perhaps the best way to think about the "flight to safety" that occurs during every crisis, resulting in lower market interest rates. There is one more reason and one that many investors seem to view as the dominant one and I will address it next. The first and more conventional path is for the central bank to signal, through its actions on the rates that it controls what it thinks about inflation and real growth in the future, and with that signal, it may alter long term rates. Thus, the Fed lowering the Fed funds rate (a central bank set rate that banks can borrow from the Fed Window) will be viewed as a signal that the Fed sees the economy as weaken and expects inflation to stay subdued or even non-existent, and this signal will then push expected inflation and real interest rates down. This will work only if central banks are credible in their actions, i.e., they are viewed as acting in good faith and with good information and are not gaming the market. 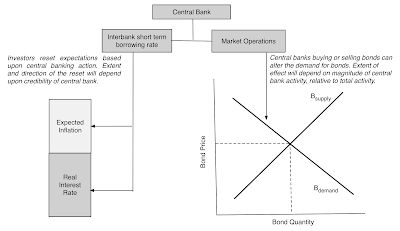 The second channel is for the central bank to actively enter the bond market and buy or sell bonds, thus affecting the demand for bonds, and interest rates. This is unusual but it is what central banks in the United States and the EU have done since 2008 under the rubric of quantitive easing. For this to have a material effect on interest rates, the central bank has to be a big enough buyer of bonds to make a difference. 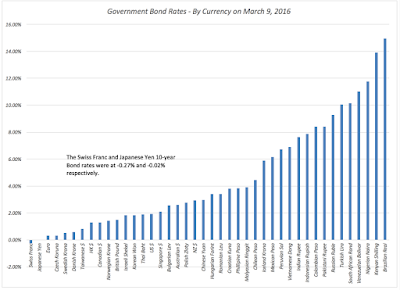 Thus, as you read the news stories about the Japanese central bank and the ECB considering negative interest rates, recognize that they cannot impose these rates by edict and that all they can do is change the rates that they control and let the signaling impact carry the message into bond markets. 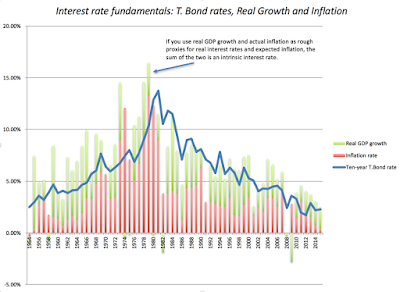 An intrinsic interest rate, computed by adding together the actual inflation each year and the real growth rate each year, two imperfect proxies for expected inflation and the real interest rate. The ten-year US treasury bond rate at the start of each year, set by the bond market, but affected by expectation setting and bond buying by the Fed. Note how closely the US treasury bond has tracked my imperfect estimate of the intrinsic interest rate, and how low the intrinsic rate has become, post-crisis. At the risk of repeating myself, the Fed has, at best, had only a marginal impact on interest rates during the last six years and it is my guess that rates would have stayed low with or without the Fed during this period. Turning to the question at hand, is it possible for nominal interest rates to be negative, based upon fundamentals? The answer is yes, but with a caveat. If the preference for current consumption over future consumption dissipates or gets close to zero and you expect deflation in a currency, you could end up with a negative interest rate. In fact, that is the common thread that runs through the economies (Japan, the Euro Zone, Switzerland) where rates have become negative. Now, comes the caveat. If you have nominal negative interest rates, why would you ever lend money out, since you have the option of just holding on to the money as cash. Historically, that has led many to believe that the floor on nominal rates should be zero. As rates go below zero, it is time to reexamine that belief. One way to reconcile negative interest rates with rational behavior is to introduce costs to holding cash and there are clearly some to factor in, especially in today's economies. The first is that while the proverbial stuffing cash under your mattress option is thrown around as a choice, you will increase your exposure to theft and may have to invest in security measures that are costly. The second is that there are some transactions that are extraordinarily cumbersome to get done with cash; imagine buying a million dollar house and counting out the cash for the payment. The Danish, Swiss and Japanese governments are embarking on a grand experiment, perhaps, of how much savers will be willing to pay for the convenience of staying cashless. In effect, the lower bound has shifted below zero but there is still one. 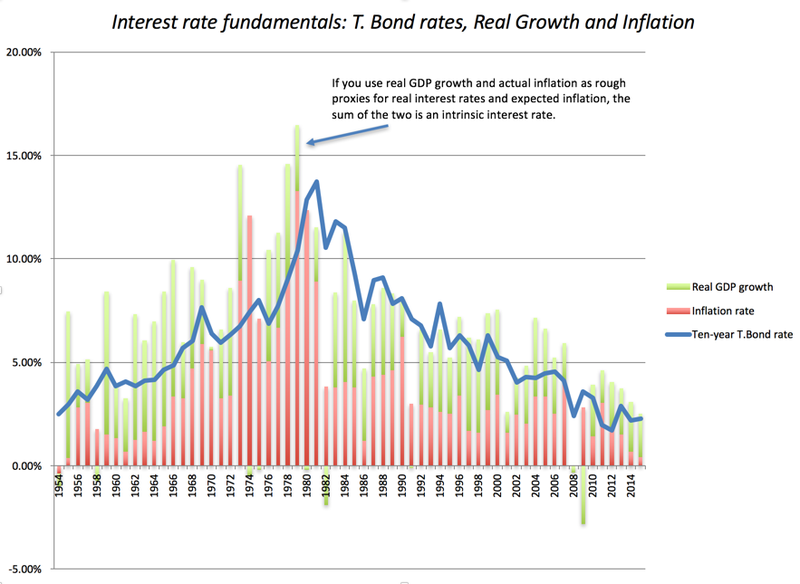 To those who are convinced that negative interest rates have nothing to do with fundamentals and that they are entirely by central bank design, I would argue that the only reason that these central banks have been able to push rates below zero, is because real growth and inflation have become so low in their economies that the intrinsic rate was close enough to zero to begin with. There is no chance that the Brazilian and Indian central banks will follow suit. So, why has it not worked? As interest rates in the US, Europe and Japan have tested new lows each year for the last few, we have not seen an explosion in real investment in these countries, and while stock prices have risen, the rise has had as much to do with higher earnings and cash flows, as it has to do with lower interest rates. In my view, the fundamental miscalculation that central banks have made is in assuming that their actions not only affect other pieces of this puzzle but are also read as signals of the future. 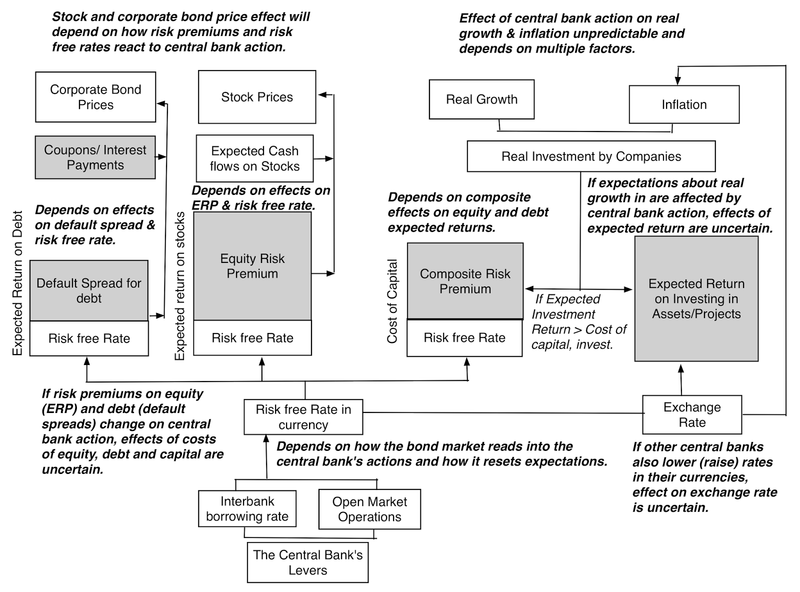 In particular, central bankers have failed to incorporate three problems: that interest rates do not always follow the central bank lead, that risk premiums on equity and debt may increase as rates go down and that exchange rate effects are muted by other central banks acting at the same time. In this reality-based central banking universe, the lowering of rates by central banks can have unpredictable and often perverse consequences, lowering financial asset prices, reducing real investment and making a currency stronger rather than weaker. This is all hypothetical, you may say, but there is evidence that markets have become much less trusting of central banking and more willing to go their own ways. 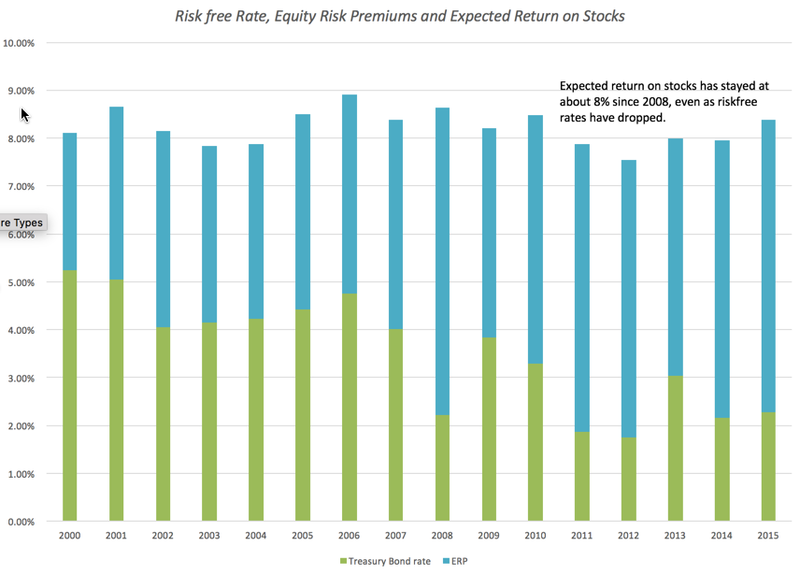 For instance, as the risk free rate has dropped over the last few years, note that the expected return for stocks has stayed around 8% during that period, leading to higher and higher equity risk premiums. While bond markets initially did not see this phenomenon, last year default spreads on bonds in every ratings class widened, even as rates dropped. Interestingly, the most recent ECB announcement that they would push the rates they control lower was accompanied by news that they would enter the bond market as buyers, hoping to keep default spreads down. That is an interesting experiment and I have a feeling that it will not end well. Switch currencies: You can value Danish companies in Euros or US dollars, where long term rates are still positive (albeit very low). This evades the problem, but you can run but you cannot hide. At some point in time, you will have to work in the negative interest rate currency. Normalize risk free rates: This is a practice that has become more prevalent in both the US and Europe, where risk free rates have dropped to historic lows. To compensate, analysts are using the average rate across long periods as a normalized risk free rate. I have problems with this approach at three levels. 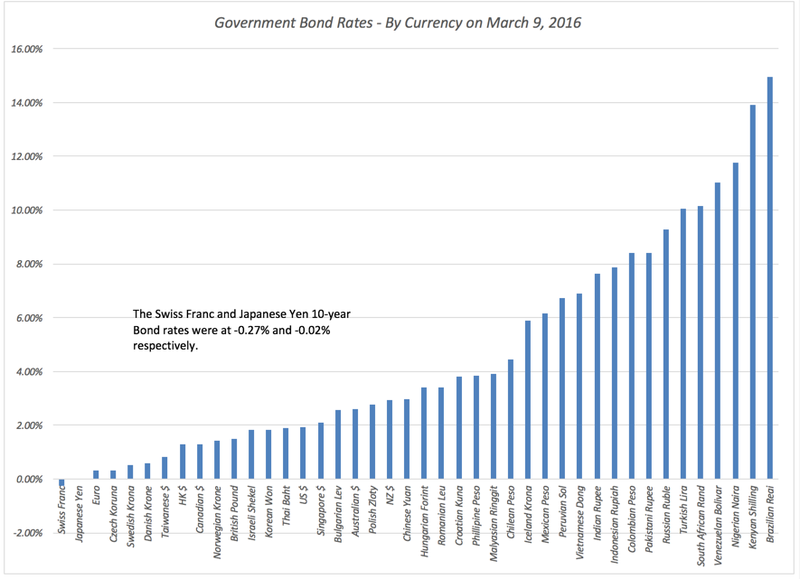 The first is that normal is in the eye of the beholder and what you call a normal 10-year T.Bond rate is more a function of your age than scientific judgment. The second is that given that the risk free rate is where you plan to put your money if you don't make your real investment, it seems singularly dangerous for this to be a made-up number. 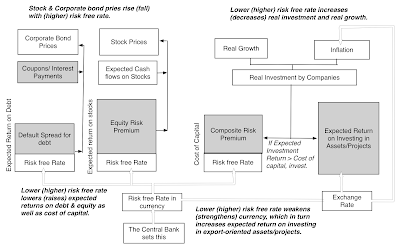 The third is that using a normalized risk free rate with the high equity risk premiums that are prevalent today will lead to too high a hurdle rate, since the latter are primarily the result of low risk free rates. 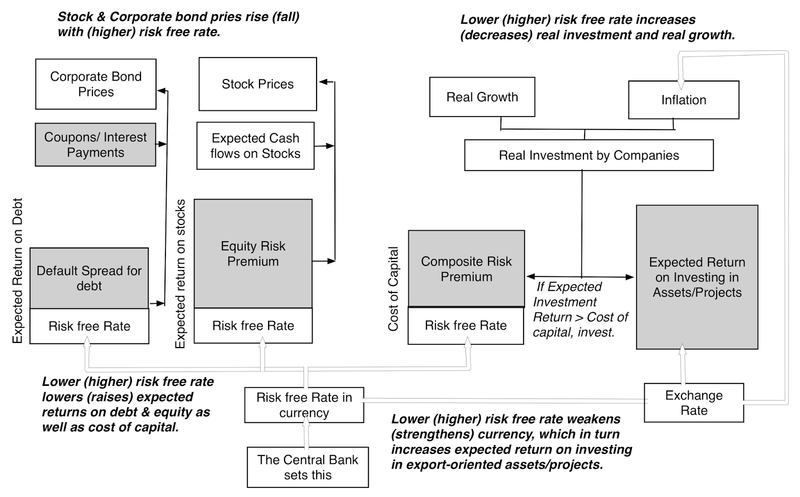 Leave the risk free rate negative: So, what if the risk free rate is negative? In valuation, you almost never use the risk free rate standing alone, but only in conjunction with a risk premium. 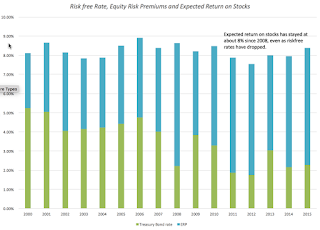 If you can update those risk premiums, they may very well offset the effect of having a negative risk free rate and yield a cost of equity and/or debt that does not look different from what it did prior to the negative interest rate setting. There is one other adjustment that I would make. In stable growth, I have been a proponent of using the risk free rate as your cap on the stable growth rate. With negative risk free rates, I would stick with this principle, since, as I noted earlier in this post, negative interest rates signify economies with low or no real growth combined with deflation and the growth rate in perpetuity for stable companies in these economies should be negative for those same reasons. When interest rates of from being really small positive numbers (0.25% or 0.50%) to really small negative numbers (-0.25% to -0.50%), the mathematical consequences are small but I do think that breaching zero has consequences and almost all of them are negative. The economic end game: For those who ultimately care about real economic growth and prosperity, negative interest rates are bad news, since they are incompatible with a healthy, growing economy. Central banks insanity, impotence and desperation: As I watch central bankers preen for the cameras and hog the limelight, I am reminded of the old definition of insanity as trying the same thing over and over, expecting a different outcome. After six years of continually trying to lower rates, with the expectation of economic growth just around the corner, it is time for central banks to perhaps recognize that this lever is not working. By the same token, the very fact that central banks revert back to the interest rate lever, when the evidence suggests that it has not worked, is a sign of desperation, an admission by central banks that they have run out of ideas. That is truly scary and perhaps explains the rise in risk premiums in financial markets and the unwillingness of companies to make real investments. Unintended consequences: As interest rates hit zero and go lower, there will be some investors, in need of fixed income, who will look in dangerous places for that income. A modern-day Bernie Madoff would need to offer only 4% in this market to attract investors to his fund and as I watch investors chase after yieldcos, MLPs and other high dividend paying entities, I am inclined to believe that is a painful reckoning ahead of us. An opening for digital currencies: In a post a few years ago, I looked at bitcoin and argued that there will be a digital currency, sooner rather than later, that meets the requirements of trust needed for a currency in wide use. The more central bankers in conventional currencies play games with interest rates, the greater is the opening for a well-designed digital currency with a dependable issuing authority to back it up. In the next few weeks, I am sure that we will read more news stories about central banks professing to be shocked that markets have not done their bidding and that economies have not revived. I am not sure whether I should attribute these rantings to the hubris of central bankers or to their blindness to market realities. Either way, I feel less comfortable with the notion that central bankers know what they are doing and that we should trust them with our economic fates.